I’m a sucker for giant robots and I’m a sucker for Victorian steam punk, which are the two things that drew me to Heavy Stream a game about Giant steam powered robots battling across Europe. There is something rather delightfully bonkers about Heavy Steam; whether it’s the ludicrous weaponry or the fact they have steam locomotives for legs. The other appeal is that this game look like a game of micro management as you assign power to weapon system, giving me a the vibe of a Eurogame mixed with the 90’s Game Workshop Titan Legions. I can’t really miss this one out; imagine the office level from Counterstrike but set ever so slightly in the future played out as a miniatures game. The game is already getting a load of press and is well on its way to unlocking its stretch goals. Not only that but it’s from an established company who’ve been producing the Mercs games for some time and had a very successful Kickstarter last year with Myth. It’s also got a rather interesting looking Mercs dice game bundled in the backer rewards. My problem with this project, and why I probably won’t be backing, is to get all the stretch goals it’s going to cost around £120 and that’s before shipping! A bit too much for my wallet but it does look rather tasty. Coup Reformation is an expansion to last year’s Coup, itself a spin off from Indie Board and Cards’ brilliant The Resistance. Coup is a mini bluffing game similar in style to games such as Love Letter and Mascarade. Players attempt to gain control by bluffing on which cards they hold but if their bluff gets called they lose out. Reformation expands the game by adding extra actions, upping the player count and adding religious factions to the base game. I’m putting this hear because I’m a big fan of the Resistance, the simple card game about spies and back stabbing and Coup was the second game in the series and has gained a lot of positive reviews. Why is everyone so pessimistic about how the future will play out? It’s always a nuclear disaster, zombie apocalypse or alien invasion. What the chances that our future might actually be quite nice? In Tracker the world is ravaged by the nuclear fallout from the world’s largest hydrogen bomb but the people who developed said bomb also developed very powerful, science defying, artefacts and you are attempting to gain control of these artefacts before the other players. Play involves attempting to complete missions and gunning down the opposing players. Unfortunately dead players don’t stay dead too long as all that radiation is causes dead players to return as zombies. It’s all an interesting premise and looks ever so slightly abstract as the game is played over a hex grid. The only slight issue is the use of dice to determine the how many actions you can complete each turn, but on the plus side it looks more like a bucket of dice than your old fashioned roll and move. Aetherium is a board based miniatures war game set in a cyberpunk’s dream. Aetherium is a virtual reality world of the future and where the players are fighting to control cyberspace. 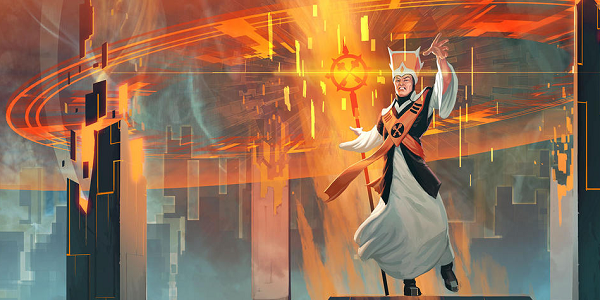 Imagine Netrunner as a miniatures game and you’re on the right track. There’s a lot of unique selling points; not only has the game got a very strong visual style, it also uses custom dice and an order system that requires players plan their moves far in advance. The big thing is that this game takes place inside a virtual reality system, so the map and terrain can change as the game progresses. I’ve include Aetherium because not only does it look sweet but they also have video guide to how the game plays, something which most miniature games don’t bother including!